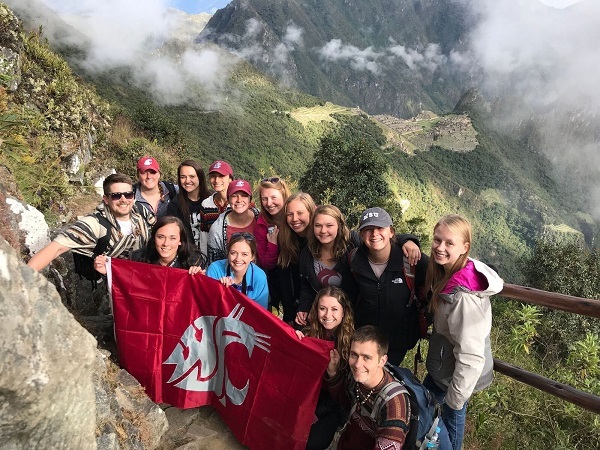 The group of WSU nursing and pharmacy students are home from Peru, but still have their memories and experiences. After spending almost three weeks in Peru, our trip has finally come to an end. As all of us make our way back home, we’re sad to see everyone go. I mean, we spent Almost Every Waking moment together! We all say our goodbyes, giving each other long bear hugs, reminiscing about funny moments and promising to keep in touch via classes or social media. Then we part ways. I can hopefully say that this trip was the best thing that has happened to all the us as a group. It greatly affected our lives and reminded us why we all want to be nurses (and a pharmacist)! 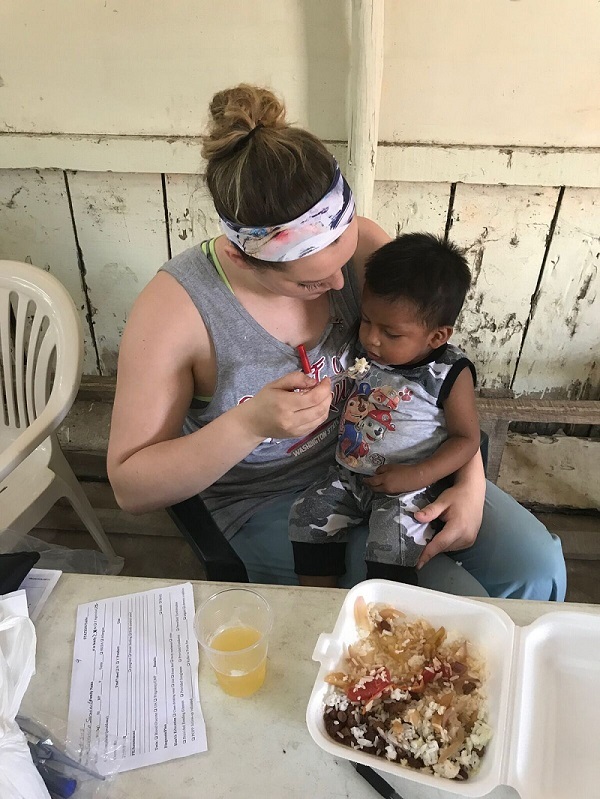 I truly believe working with the People of Peru Project and the various communities opened our eyes, and made a big impact in the way that we interact and provide aid. It improved my nursing skills and nursing judgement. And although I’m not fluent in Spanish, watching people’s smiles and receiving their hugs were the small gestures that showed me why I strive to become a nurse. This experience was very rewarding, and even life changing! I encourage anyone who reads this blog to not only give back but to be influenced to be a part of change, whether that it is big or small. I hope to one day return to Peru, not as a nursing student but as a BSN. ¡Hasta la próxima Aventura, ir a Cougs! Erica Hookland at the top of Rainbow Mountain. Today was our last full day here in the beautiful city of Cusco. We were rewarded with a free day and were given several different options as to what each of us wanted to do for our last day in Peru. Some people chose to tour the Catholic Churches around Cusco and others decided to ride horses up to visit the ancient Incan ruins on the outskirts of town. 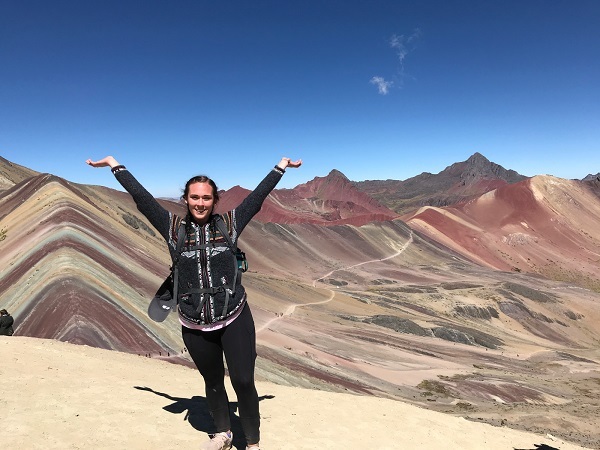 Four of us had our hearts set on hiking Rainbow Mountain, better known by the locals as Montaña de Colores, with an altitude of over 17,000 feet above sea level. Our day started at 0300 when we got up for our hiking adventure. We layered in warm clothing, grabbed a small bite to eat and got onto the bus at 0400. Our ride up into the mountains was around 3.5 hours. We started off on our dusty hike around 0840 and were given walking sticks to assist us on our way up. We faced several challenges along this hike, as we experienced sudden increases in elevation and temperature changes. We we re constantly taking jackets off and putting them back on. Right off the bat, we were working harder to breath, and experienced shortness of breath, headaches, nausea, and paresthesia in our hands and fingertips. As a group we persevered in the face of altitude changes, hot and cold weather temperatures, and oxygen deprivation as we made our way up the mountain. We motivated each other to keep going, taking breaks every five minutes to catch our breath, and reminded ourselves that as Cougs we can do anything we put our minds to! We made it to the top in less than 2.5 hours. Our experience today was a wonderful example of maximizing health potential through choosing to exercise, and facing fears of altitude sickness and heights. Along the hike there were horses strategically placed on uphill sections of the trail that we could have easily rented and rode up to the top. Although we were dead tired and breathing heavily, we continued trudging up the mountainside by foot. I learned that perseverance and dedication allowed me to accomplish my goal of hiking up the highest mountain I’ve ever done in my life without any assistance. The vibrant colors at the peak of rainbow mountain made all the struggles and doubtful thinking along the way so worth our treacherous journey. 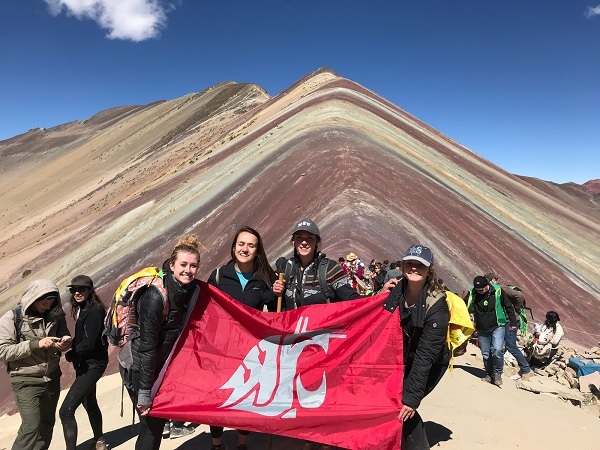 Four WSU students elected to hike up Peru’s Rainbow Mountain on their last day of the trip. WSU nursing and pharmacy students at the Sun Gate overlooking Machu Picchu. On day 17, our alarms sounded at 3:45 am in hopes of seeing the sunrise over Machu Picchu. We enjoyed a fresh breakfast at the hostel and made our way to the buses at 5 am. We finally headed up to Machu Picchu on a windy road that curved back and forth across the mountainside. The ride up was very fast and somewhat scary, but it was as if these drivers have been doing it for 20 years. At the drop-off point, we eagerly waited to enter the ruins as it was the first Wonder of the World experience for most of us. We immediately began our climb to Sun Gate, which is a viewpoint that looks down on Machu Picchu. We followed a bumpy, rocky path known as the Inca trail — the original path that the Incas created for their travels. The climb up was exhausting but we tried to stay positive and keep going. I reminded my fellow climbers that we should be extremely thankful for having the ability to climb up the mountain. Many people with disabilities or serious medical conditions are unable to do what we had just accomplished. It’s sad to think that some people could be prevented from experiencing Machu Picchu due to their health conditions. The view at the top of Sun Gate was so beautiful it almost didn’t look real; it was breathtaking. We stayed at the top for about 30 minutes taking in the beauty and of course taking some photos. We then headed back down the mountain to meet our tour guide at 9 am to learn about the history of the ruins. She told us that the ruins extend below the ground to provide stability to withstand earthquakes in the area. She compared them to the game of Jenga — the blocks in the bottom of the stack provide a solid foundation for the blocks on the top of the stack if built correctly. The architectural knowledge the Incas possessed so long ago is truly amazing. 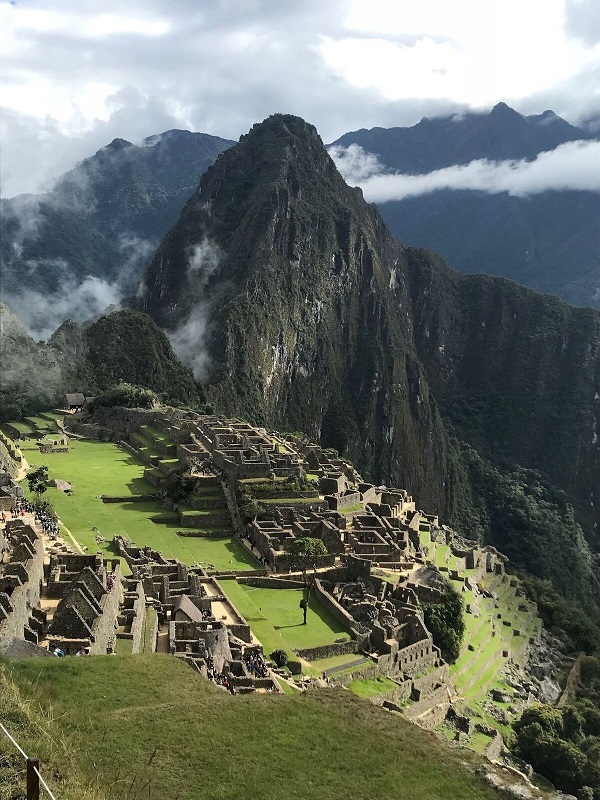 A view of Machu Picchu. Throughout the tour we were introduced to more technology that the Incas used during their time. One example is the “espejos de agua,” which translates to water mirrors. The mirrors were built out of stone bowls with flat bottoms and where filled with a thin layer of red-colored sand. If you stand at the correct angle to the sun and look into the bowl, you can see a bright reflection of the sun. These water mirrors were also used to see the stars. Now, we use telescopes to see the same things that they saw thousands of years ago. As the tour came to an end it was time to say goodbye to Machu Picchu. We stood in line to stamp our passports as a memory that we had just witnessed one of the Seven Wonders of the World. Machu Picchu was amazing. People from around the world unite to see these historic ruins on the top of a mountain. After touring and hiking, many of us went to lunch before we were to be back at the train station at 2:50 pm. Our train finally left and we were headed back to Cusco where we would hop in a bus to reach our final destination at Casa Elena. After four hours of travel we finally arrived home. We spent the rest of the night preparing for our free day and reminiscing on the wonder and beauty of Machu Picchu. The group poses overlooking the Sacred Valley of the Incas. Today was our 16th day of our trip! We all got up bright and early and left our hotel in Cusco at 0800 to get on a bus headed towards the Sacred Valley of the Incas. Along the way, we stopped several times and appreciated the Peruvian culture even more. Our first stop was to a gorgeous spot that overlooked the whole Sacred Valley. Looking out it felt like we were back home in Washington. There was a river flowing through the valley, lots of farmland, and mountains all around, some with snow still on their caps. We all got back on the bus and headed to our next destination; the Pisac market. 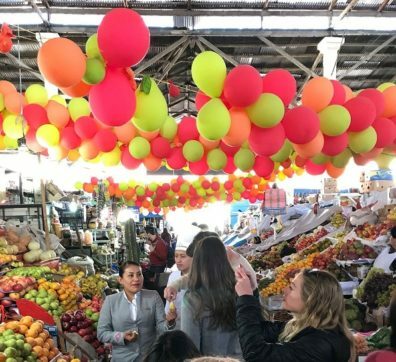 Throughout the trip we have seen many different markets, and this one seemed to be the biggest yet! One thing I learned was that the vendors are very appreciative when customers pay in cash. If you pay with a card, 10 percent goes to the credit card company, meaning vendors get even less for their work. After talking with some of the sellers about their work and products, it makes you want to barter less and pay the price they are asking because of all the hours they put into it and the sleep they sacrificed. 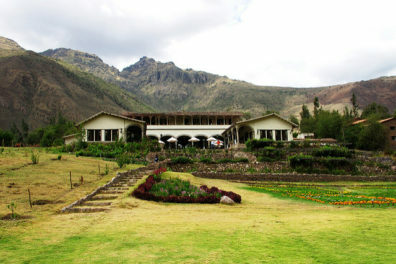 Tunupa restaurant in Urubamba, Peru. Photo via Flickr by catderby. After the market we went to lunch at a restaurant called Tunupa. It was a giant buffet that had every option of food you could think of. The restaurant was beautiful, sitting on a hillside right above the river with a huge flower garden outside, and to top it off, a couple llamas in the field for petting and picture taking. 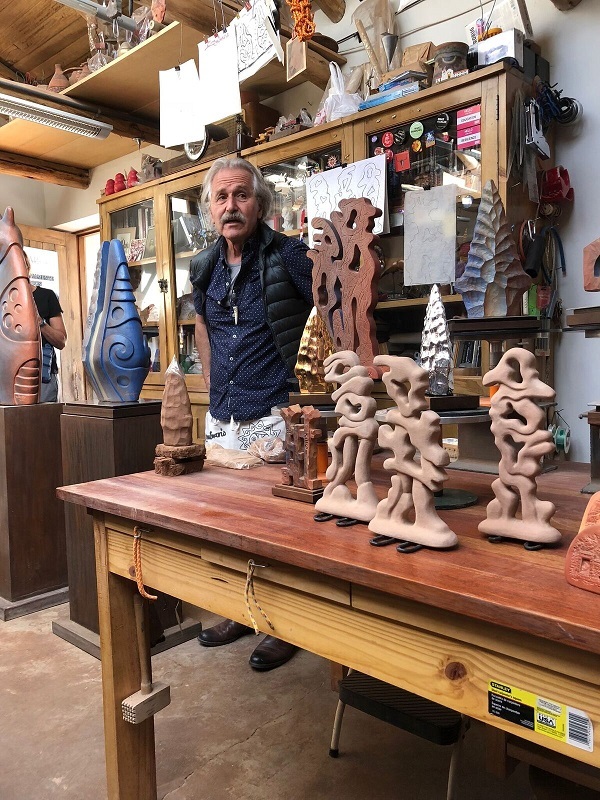 Our final destination before getting on the train to go to Machu Picchu was a pottery gallery/workshop owned by ceramic artist Pablo Seminario. We were able to watch a short video about the influences on his art, then we toured the gallery and saw the process of pottery-making. To complete the tour, we were lucky enough to meet Pablo Seminario himself! Ceramic artist Pablo Seminario in his gallery. He was so kind, inviting us all into his personal workshop and showing us his pieces and telling us his journey of artistry. He was the most humble man; he has pieces in the major museums and it didn’t seem to boost his ego one bit. It was a long day of traveling on the bus, but we were all so happy for the places we went and all the amazing people we were able to meet and hear their life stories! WSU students conduct a community assessment in a market in Cusco, Peru. Today was our second day in the beautiful Cusco, Peru! This morning we split into groups to explore and complete a community assessment with translators. Each group focused on one of the WSU College of Nursing core values: integrity, maximizing health potential, caring, altruism and social justice. 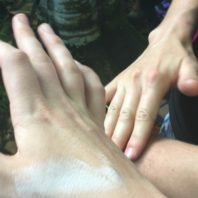 The group I was a part of had the ability to highlight both caring and altruism traits. We set off to one of the main markets to find local people and ask them questions about their lives, their healthcare, and give each of us the opportunity to find these core values in the people of Cusco as well. The market was busy with lots of people; tourists and locals. It was bright and clean with tons of fruits and vegetables organized on the tables neatly and in artistic ways. 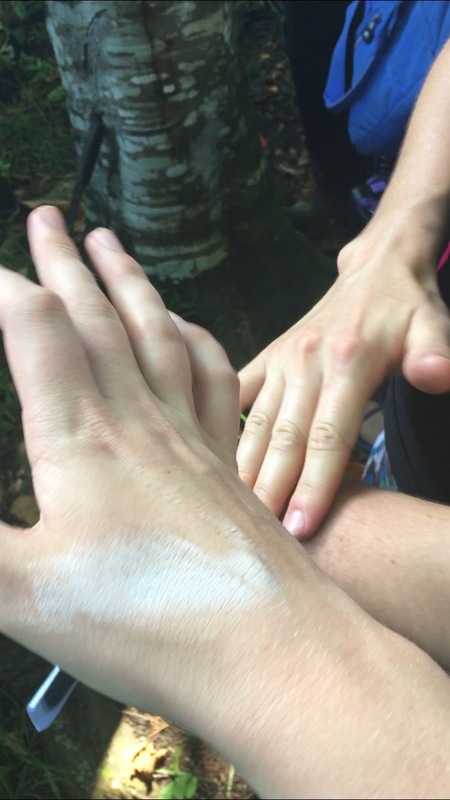 As my group walked through, we found a stand that provided natural healing. There were different buckets filled with herbs, flowers, and other non-traditional medication. Signs filled the stand saying the different ailments that the providers specialized in healing, ranging from headaches to Alzheimer’s. 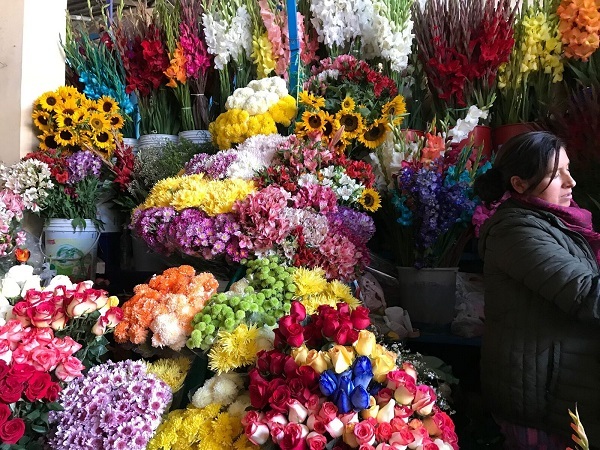 A scene from the market in Cusco, Peru. We asked the man at the table if he could create something for headaches (as each of us had one due to high altitude, lack of oxygen, and some lack of sleep!) He took a large ladle and scooped from multiple buckets, filling a total of four plastic cups, then he instructed us which to drink first, second, third and fourth. They were very bitter and not very tasty but afterwards we all truthfully felt some relief from our headaches!! Upon talking to the man at the natural healing stand, we learned that he had a degree from a well-known University in biology. He had a passion for providing care to those around him and loved the ability to create different remedies depending on what each person needed. This was something that was passed on to him from his father, and his grandfather, and he shared that he was happy to be involved in this through his family. This was really touching to me as both my mother and my sister are nurses, and because of the strength, compassion and love that I have been able to see in them throughout my life, this has made a huge impact on my drive to become a nurse. We felt this man was a perfect example of caring and altruism as he gives to people each day, to make their lives healthier and happier. The rest of our day was spent exploring the city and all the beautiful colors and architecture that surrounds it. Each of our days in Peru has been filled with the most amazing people and I can’t wait to see who else we are able to connect with! Plaza de Armas in Cusco, Peru. Photo by Aaron Logan, via Flickr. Today was filled with so many emotions. Leaving Iquitos was hard to do. In the past two weeks we made such great friends and felt like I was leaving family behind. In those two weeks I was able to fully appreciate the love and resilience of Peruvian people. Iquitos has truly won my heart. I was also very excited to travel to Cusco. We spent most of the morning in the Lima airport. We arrived in Cusco exhausted but amazed at its beauty. Cusco’s elevation is about 11,000 feet above sea level. We arrived at a beautiful hotel called Casa Elena and were greeted with hot cups of coca tea to prevent altitude sickness. The rest of the afternoon was a free day to just relax and get our bodies used to the high altitude. Some of my classmates felt sick and even needed some oxygen to help relieve some of their symptoms. What I have seen in this group is how we care for one another. We have been in this trip together for two weeks but feel we are all one big family. I was the only one that came from the Tri-Cities campus but no one would ever know. These girls have taken me as part of them from day one. I feel so humbled and blessed to be part of such a great school. The dedication and compassion I see in my classmates gives me fuel to keep going and give more of myself. After resting for about an hour in the room waiting for the coca tea to kick in my roommates and I decided to take a short walk around Plaza de Armas, which is Cusco’s main square. 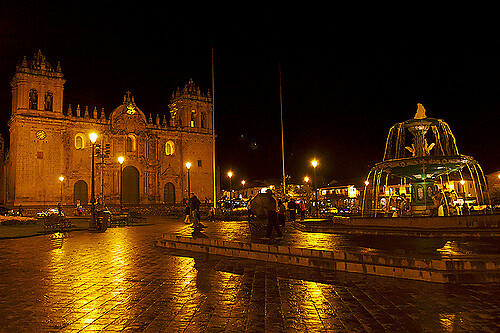 It is a gorgeous plaza surrounded by a cathedral, churches and lots of shops. There are tourists from all over the world walking around talking different languages. There are also people dressed in their native costumes walking around with baby alpacas. A couple of my roommates stopped to take pictures with them. Today we did not have any activities or tours to do. This was a good day to just rest and enjoy the views of Cusco, a town with amazing architecture and detail. After two flights in 48 hours this was a much needed break. I am so excited to learn more about the people in Cusco, as well as its history and culture. Plaza de Armas in Lima, Peru. Photo by Christian Cordova via Flickr. We started day 13 in Peru bright and early. We were all packed and ready the night before to catch an early breakfast with our favorite cooks. They prepared our favorite oatmeal drink called Chicha Avena. The cooks arrived around 4 am to prepare our last meal on the compound and it was delicious! We boarded the People of Peru bus for the last time around 6:45 am. It was a bittersweet goodbye. We were leaving behind people that we have grown to know and love, knowing that we were off to start another amazing adventure. Our flight from Iquitos to Lima was 2 hours. Most of us tried to rest during the flight. Once we arrived in Lima, we all fanned out in the airport to conquer the food court. Starbucks was a hotspot for our morning coffee. After filling our bellies, we set off on a huge tour bus that was to be our transportation for the day. Although it looked luxurious, we were all missing the friendly, warm, and inviting People of Peru bus and the fresh breeze that it brought to us through the open windows. 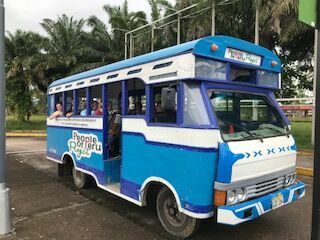 As we got used to our new bus, we began to notice some of the differences that Lima has from Iquitos. The first thing we immediately noticed was the lack of motorcars which were replaced by sedans, SUVs and tour buses. 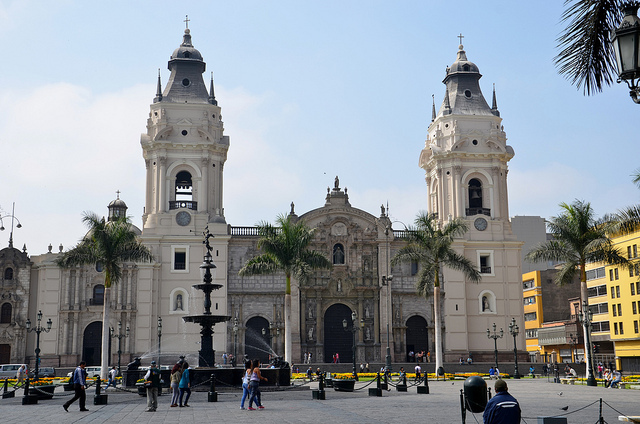 Everything in Lima is busy as would be expected from the capital city of Peru. Paul, our host with the People of Peru Project, is so exciting, engaging and kindhearted. As we stopped in the central square, the first thing he wanted to do was take us to eat what he called the best churros you’ll ever eat in your life. We all agreed! They were unlike any churro we had ever eaten, twisted, deep-fried, and cream-filled. Yum! Once we finished our churros, we had the choice of separating as a group and either going shopping/sightseeing, or touring the Catacombs. The one thing that you should know about our group is that we will never say no to a new experience. Of course we ALL decided, as a group, to tour the Catacombs. The mystery and historical education was too much to miss. One thing that we all thought about while we were looking at the skeletons was how much we have learned over the years as nursing and pharmacy students. Each room we walked through was full of the sound of intelligence as people called out the names of bones they saw. One thing that is not surprising about our group here in Peru is how much we want to continue learning. We came here to learn about the culture, the healthcare system, and the people of Peru. This is reflected in the amount of Spanish we have picked up in the past two weeks. It is quite impressive. As we visited a nursing home today, students split up into small groups to visit with the grandparents, as as they are called here. Students sat comfortably on the beds and talked to the residents. They spoke about their families and how much they loved the snacks that we brought for them. Some even got a chance to read some books to them. For others, simply sitting and holding the hand of a resident was a highlight of their day. This is just another shining example of the communication piece that goes along with every other aspect of nursing. 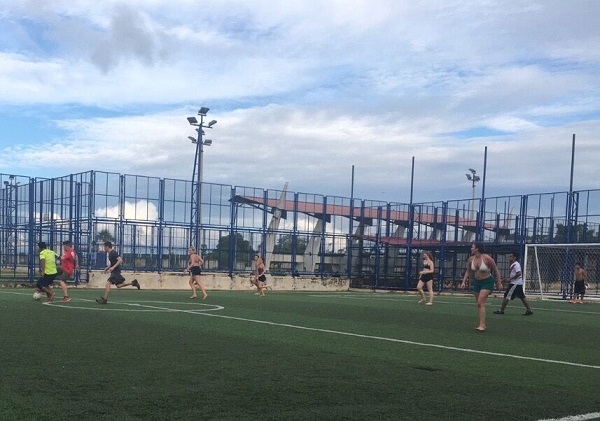 WSU nursing and pharmacy students play soccer on a free day in Iquitos, Peru. Today was a whirlwind of emotions for everyone. It was our last full day in Iquitos, Peru. For the past few weeks we have been roaming the streets and becoming familiar with the beautiful city. We have really gotten close to everyone here and have truly fallen in love with the city. Today was our first free day that we had in weeks and yet we were all were up and ready for our delicious breakfast at 7:30 in the morning . It was at this point that it started to sink in that this was the last time I would sit down with all of my friends for an authentic Peruvian breakfast. It was then that I knew I was in for a very long and emotional day. For our free day we decided to visit The Amazon Rescue Center. This is a manatee rescue and rehabilitation center that partnered with The Dallas World Aquarium. Since they opened 10 years ago, they have rescued and released several dozen manatees back into the Amazonian wild. We had the opportunity to see several manatees, many different types of turtles, monkeys and alligators, as well as a mongoose and a very cute baby sloth. It was amazing to see all of the valuable work they do there. The staff work really hard to rehabilitate the animals so they can be released into the wild. After we got back to the compound, we went across the street to a local market for the last time to shop for some last-minute gifts for our friends and family. As I was walking I thought back to the first time we walked the streets of Iquitos. I remember feeling a bit anxious and scared and just trying to take everything in. Even though I had taken multiple Spanish classes, I was not able to understand anything and felt so out of place. Fast forward to two weeks later, we walked the streets with confidence and even used what Spanish we learned to bargain for a better price with the local vendors. For the second half of the day, we went to our farewell party at a local water park. We were joined by everyone who took part in making these past two weeks just incredible for us. A majority of the translators, the cooks, the staff and their families joined us in celebration. For many of the Peruvians there, it was their first time on the water slides so they were a bit afraid to go down the 30-foot drops. We had a great time just enjoying the water despite the rain. After we cooled off a bit, we played a bit of soccer and volleyball. We found out that a lot of the students had been hiding some amazing soccer talents . Things got a bit competitive, but in the end we all had a lot of fun. A dance party was also on the schedule for the group’s last day in Iquitos. Later, we had Mark’s and Elmer’s (two of our translators) band play some music as we danced the evening and the night away. Even though our dance moves were nowhere near as graceful as the local Peruvians, we still managed to show off our skills. We finished the evening by saying thank you and good bye to everyone. Many tears were shed as we reflected on our time together over the past few weeks. It was then when it started to sink in that this was the last time that most of us would see these incredible individuals. We had gotten so comfortable and in a way we had become one huge family. We shared many laughs and countless memories. This was a life changing experience for me, and I’m sure all of the students would agree. I was amazed on how open and welcoming everyone was. We were foreigners in their country and yet they treat ed us as their own. This is one trip that I will never forget and I will cherish these memories for the rest of my life. Thank you for the amazing time Iquitos! Next Stop Lima, Peru. 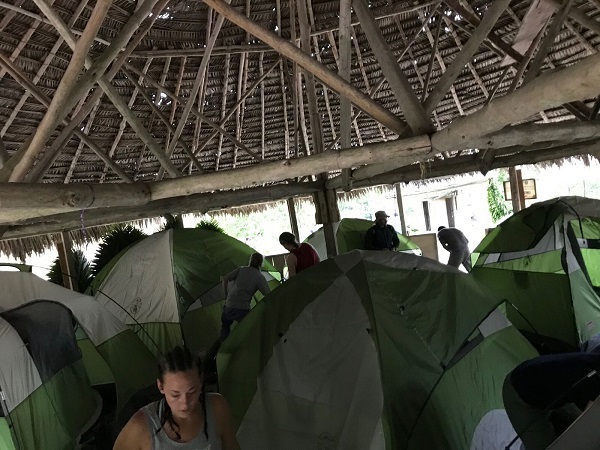 The group slept in tents under a thatch roof while holding a health clinic in a village in the Peruvian jungle. 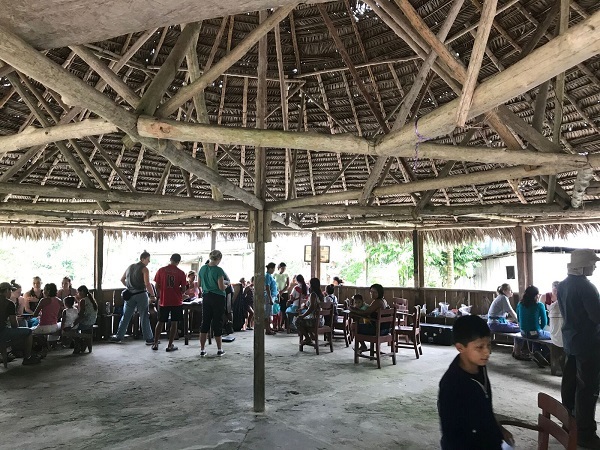 A health clinic is held in a village in the Peruvian jungle. Today was incredible, just like every day here in Peru. We slept in tents last night under a wooden structure with a thatch roof and a cement floor. Not very many people slept well with the heat and the noises the rooster made throughout the night. When everyone woke up we were all exhausted. No one wanted to get up and start the day, but no one could keep sleeping either. We all got up and packed up so we could get ready for our final clinic that would happen in about an hour. After everything was loaded back on the boat and we had eaten breakfast we started setting up the clinic. It amazed me how even though we were all tired, cranky and smelly, we were able to muster what energy we had to care for the people in the jungle village. We all got into our groove and started triaging and assessing so we could help the people who lived there get medications and education that they needed. We saw a lot of patients with headaches and flu symptoms, patients wanting medications for parasites and patients who simply wanted reading glasses. It is incredible to see this team work together to make sure these people have what we can give them so they can be healthy. Everyone in our team is so caring. Everyone jumps in when something needs to be done or a person needs to be helped. 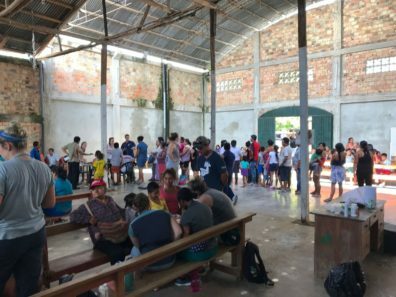 Our clinic only lasted a couple of hours so we could make it back to Iquitos at a good time, but we were still able to help around 95 people. That’s 95 more people with reading glasses, parasite medication, fluoride on their teeth, vitamins, antibiotics, or simple analgesics like Tylenol. 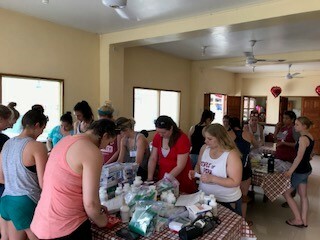 It may not have been a long clinic and we may have been incredibly tired, incredibly sweaty and covered in bug spray, but we were still able to help those 95 adults and children. It was so rewarding to see them smile and wave at us as they left the clinic and as we packed up to get on the boat. It’s a feeling I’m sure we’ll always remember. Once we were back on the boat many of us fell asleep, but eventually we got to a small stop where we could go swimming in the river. It was a relaxing end to the day. It was one of those moments where you look around and realize where you are and what you’re doing. You see the river, trees and butterflies and realize how far away from home you really are, but how much you love the place you’re in and what you’re doing. 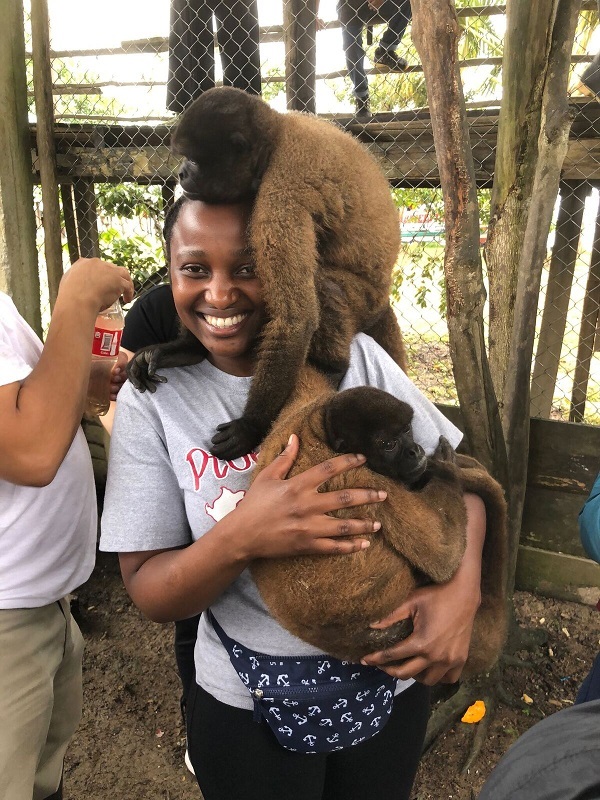 Maria Namuddu at the monkey village in Peru. My experience in the jungle is one I would not trade for anything else. Our day started with flooded rooms at the compound. The night before we left for the jungle, a security guard from the compound knocked on our doors at around 11:55 pm to let us know that there is a chance of our rooms flooding. We needed to move our stuff off the ground, and five minutes later water started rushing into the room. We were so grateful that he went out of his way to give us that information otherwise our stuff would have been soaked. In the morning we cleaned out our rooms, loaded our luggage and left for the Jungle. The sail on the Nanay River was amazing. The view from the top of the boat was breathtaking, and we took turns breathing in the cool air and enjoying the view. On the way our first stop was the monkey village; this was my favorite part of the journey because monkeys are my favorite animals. Once you have bananas, you are a monkey’s friend and before we knew it, everyone was holding a monkey. There were many different kinds of animals and we were fortunate to take pictures with some of them, including snakes (anacondas), jaguar, sloth and birds. I chickened out and I couldn’t take a picture with the snake. Our next visit was at the Bora tribe. People from this tribe were so happy to see us that they welcomed us into their compound with joy and smiles on their faces. They performed dances for us and we were able to join in with them as they danced. This was so exciting as everyone was engaged in the dances. I was surprised to see that they still use a big wooden drum to call people in the community as we did in Uganda, back in the day. We bought souvenirs and we set off for the rest of the trip to the jungle. When we arrived at the village where we were staying, we found the villagers waiting for us with open arms. We unloaded our stuff and set-up our tents for the night. We put on our boots and trudged along a muddy path through the jungle using headlamps and flashlights. No one in the group stayed behind, which shows how far we are willing to go as nurses to make a difference in someone else’s life. The long walk also touched my heart as we experienced what the people in this village go through on a daily basis to get to different places like schools, wells and hospitals. While out there we took a moment of silence to listen to the jungle symphony, it was relaxing and made us appreciate nature even more. 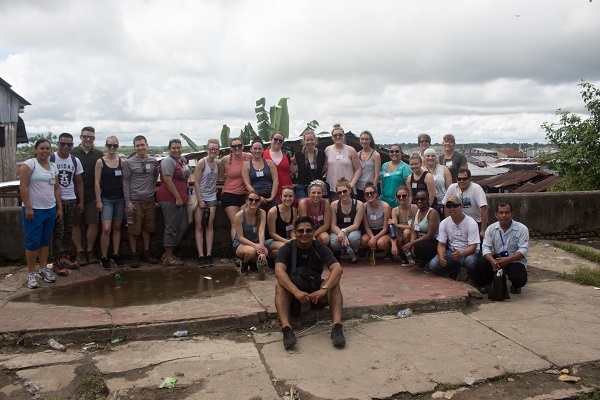 Day 9 is the last day the WSU group spent in Iquitos, Peru. Today we had our last full clinic day here in Iquitos. We drove about 10-15 minutes from our compound to Santo Tomas where our clinic was held. On our way there, I was intrigued to see the different types of homes that people lived in. Some people had cement and brick structures that seemed to resemble the types of homes we were used to seeing in the U.S., while others had makeshift houses that were heavily affected by the severe rain the night before. Once we got to Santo Thomas, we set up all our supplies in a cemented building with light wood walls. I was particularly excited about today’s clinic since it was the first time I would be a part of the triage team. Jenny and I, along with translators, were able to triage 96 people before lunch. It was amazing to see the size of families coming in and that children often followed wherever the excitement was. Through triaging people alone, we were able to see things like Grave’s disease,the type of hypertension that makes you recheck blood pressure 4-5 times, enlarged shoulders and hands which would later be determined to be cancer, and everything in between. Triage itself is extremely important as it serves as the backbone of the assessment. It is the first qualitative data we have on a person and it begins to tell their story. Through further assessment, questioning, and testing, we then can have all the tools to appropriately help someone. Once again, the cooks here spoiled us with another amazing meal. For the first time since leaving home, I had pasta! After a quick lunch and time to regroup, we were ready to tackle the remaining people who sought out help. For the second half of the day, I was part of an assessment team. Being in an an assessment team allows me the chance to look at a person’s symptoms, their worries and concerns, and their overall health status to determine appropriate care moving forward. Being in Peru, I have been given the special opportunity to step outside of my culture and learn more about another. Here in Iquitos, alternative medicine seems to be very prevalent among the people I have worked with. 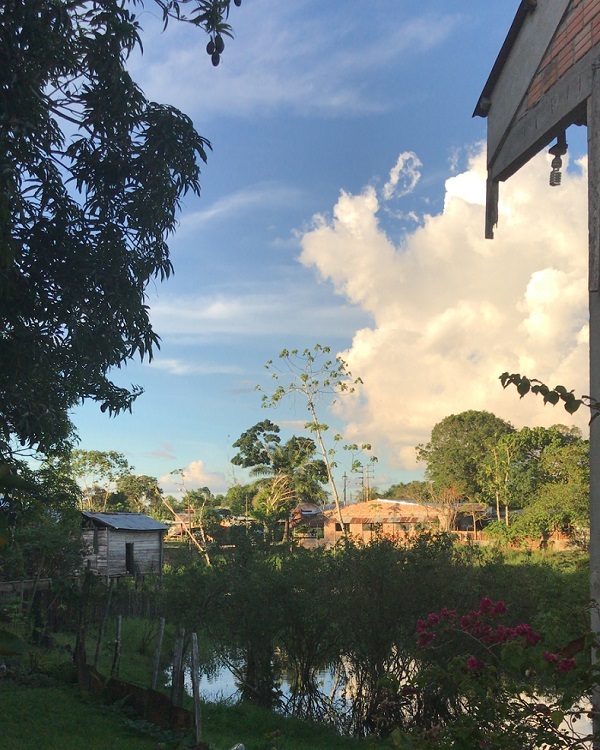 Instead of just looking at medications as treatments, I have been able to learn to look at herbal medications , at home remedies, and treatments specific to the area of Iquitos and how that can help patients here. It has solidified the importance of holistic care and looking at the bigger picture when providing care. 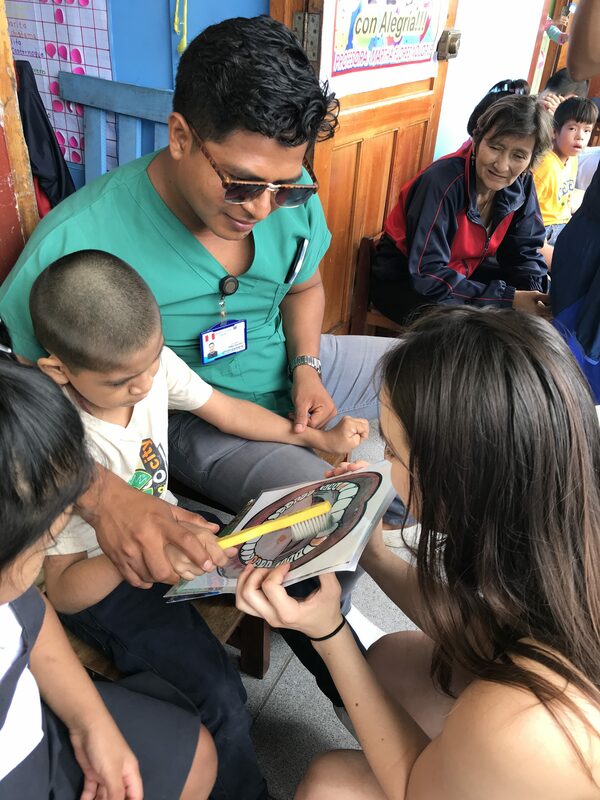 WSU College of Nursing student Bailee Jones at a clinic visit in Peru. Every single day while we are in Peru, we face the challenge of the unknown in our clinics. This is one of my most favorite aspects of being in Iquitos with my peers. Everyone has this extraordinary capacity to just let go of all preconceived ideas of what American medicine may look like, because it is so different here. Today as we were getting closer to our clinic site, the roads changed from asphalt, to dirt, to trash, which as we know inherently becomes more unsanitary. We unloaded our supplies with the faces of the Peruvian children poking in the doors with eyes full of curiosity. Every clinic we set up dental, pharmacy, and our assessment teams and every day we get more efficient. For example, we figured out today that being able to lead the patients to be evaluated by dentistry while we prepare medications allowed us maximum time to see more people and provide more care for those in need. After observing the surroundings of our clinic site, we gave more health education to keep these people environmentally safe. Every clinic makes me realize that things that may be common sense to me, are completely unknown here. Today after lunch, a mom came over with her young son and plopped him on my lap. He sat with me as I fed him and it became clear he was malnourished. He had not been assessed yet so I enjoyed getting to love on this little boy for a while. When the family came through the clinic, I was working pharmacy and read at the bottom of the evaluation paper – “Possible Scabies, 2 months”. I didn’t know whether to laugh or cry. I think this perfectly shows the issue down here of lack of health education on cleanliness or when to go see the clinic when a child has a rash on his chest. But the best part of today was going to the bathroom! It is a privilege to have a bathroom in a clinic site, and in this site it was upstairs, where a family lived. They allowed us into their home and it was amazing to see how they care so much for their things. Everything neatly folded, freshly swept, and clearly very organized. I was joined by my faculty Sarah who graciously held the curtain shut for me and I just enjoyed thinking how that situation gave a whole new meaning to student-teacher bonding. Near the clinic in Peru. The start of our day today was marked by a 6 am wake-up call from the compound’s pet parrots, which was not an entirely enjoyable awakening to a few students. However, it provided a comedic punchline for the day and how often are we able to say that parrots served as our alarm clocks? We started the day with tours of the local colleges of medicine and nursing. One of the many things that I have really enjoyed during my time here has been the warm, genuine hospitality that we have been greeted with during every tour and clinic. The nursing school faculty who led our tour was so welcoming and kept offering for us to come back any time. It was very interesting to see the similarities between our nursing program and theirs. One huge difference between them is the cost; in Peru it only costs about 87 soles, which is equivalent to less than $30, per semester to attend school. We were all pretty jealous about this! 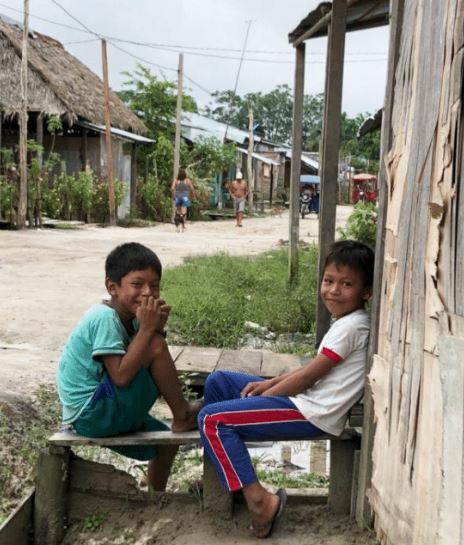 Their insight into the community health needs of Iquitos helped us to better understand some of the specific health issues that we need to be alert for during clinic. During this busy day we also conducted a clinic in a small church in Santo Thomas. My favorite part about going into this part of town is that the people come out of their homes to greet us and the children grin and wave as our big, blue bus passes by. Again, the sense of welcome and gratitude from the community was palpable. During the clinic, I was part of an assessment/diagnosis team, which allowed me to work together with two of my peers and an interpreter in order to determine the needs of our patients. I learned so much through the group collaboration and the consensus was that the clinic was a big success! As I watched another group of peers listen to a female patient’s history with such concern and empathy I was reminded of the fact that we may be providing the only medical care that some of these people receive and how important the work we are doing here is. We treated over 50 patients in the 2.5 hours that we were there and were very pleased because we saw many serious conditions that we were able to diagnose and treat. To me, this is one of the most exciting parts of the trip because I can see my assessment abilities improving and, without advanced degrees in nursing, we won’t get the opportunity to assist in patient diagnosis like this again. This trip has already inspired me more than I could have ever imagined and I believe that we are really making a difference in the lives of these people. I’m excited to see what the rest of the trip brings! Benjamin, a local dentist working with the People of Peru Project team from WSU, educates children on the importance of taking care of their teeth. As we wrap up our fifth day in Peru, words cannot describe how incredible this community is. This morning we were fortunate enough to tour a school for the intellectually and/or physically disabled where they learned how to bead, use all five of their senses, and communicate. When we got there we learned that many of the children could not communicate or speak before attending the school, and the staff was able to use rehabilitation to teach them to communicate with one another in their own way. The second we walked into the room to teach the children how to properly wash their hands and brush their teeth, the kids ran up to us and gave us the most heartwarming hugs. The teachers also individually taught the children based on their own learning needs and disabilities. In this school, every child was truly valued by the teachers and by one another. Seeing the happiness and love these children possessed regardless of their current circumstance has given me a new outlook on life. Later in the day we had the opportunity to go to a lovely facility for children with speech and hearing disabilities. The facility was run by a family who had the dream of helping deaf children learn sign language so they would be able to communicate with each other. Living a life in the jungle where there is no way to communicate with anyone due to being deaf is truly devastating. When we were sitting with the children they were all laughing and joking with each other which was so lovely to see. To think a couple, with one working parent who drives a taxi for an income, is able to provide food, shelter, and education for over 20 students is remarkable. They were so welcoming to us and even sang us a song using sign language, which brought a smile to everyone’s faces. Our final experience of the day was one of the most touching. I will forever be thankful to have been able to attend “the house for God,” which is a house run by a nurse who cares for people who suffer from HIV/AIDS. They are given a place where they are all accepted by one another and have people to relate to. Here in Peru, HIV is not widely accepted or understood. We were fortunate to have been able to listen to some of the stories from people who live with HIV. A young man expressed to us how stigmatized he is by society and if “the house for God” didn’t exist, he would be out on the street eating garbage. This statement silenced the room and showed the true reality of how hard life must be for someone suffering from this illness in Peru. When leaving the facility, we shook everyone’s hands and thanked them for opening themselves up to us. The simple gesture of human contact brought some of them to tears and opened our eyes to the harsh reality of the stigma of HIV/ AIDS. Every experience we had today changed the way we view ourselves and those around us. I will forever be thankful for how welcoming and generous the Peruvian people were to us today and showing us their way of life and how they help others. 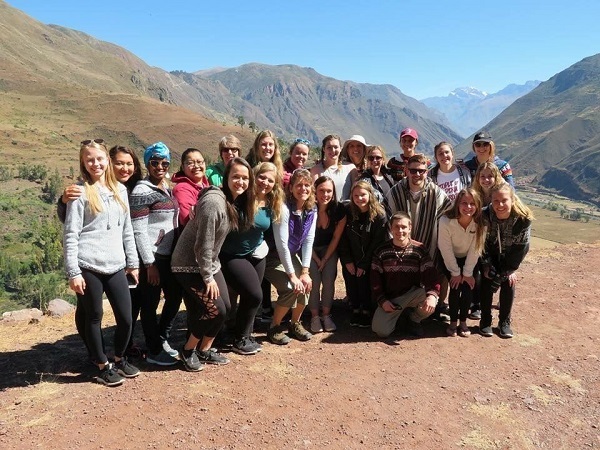 WSU College of Nursing students help staff a health clinic in Peru. To say today was an amazing experience would be an understatement. We started our day with an 8:30 am bus ride to a community, Versalles. We set up a health clinic where we would assess and help treat patients based upon their diagnoses. We had a triage team, assessment team (x4), dental team, and pharmacy team. There was many behind-the-scenes workers involved throughout our day as well. There were families waiting outside when we arrived, only to have the line double, then triple, before we could settle ourselves and prepare our supplies for the day. At first, it was chaotic trying to understand how the day would be, but seeing the the individuals eager to better their health provided motivation for each of our healthcare team members. I had the privilege to assess patients throughout the health clinic today, and see many different diagnoses and families. I was first of all able to expand my Spanish vocabulary, which was quite exciting considering I know very little of the Spanish language. 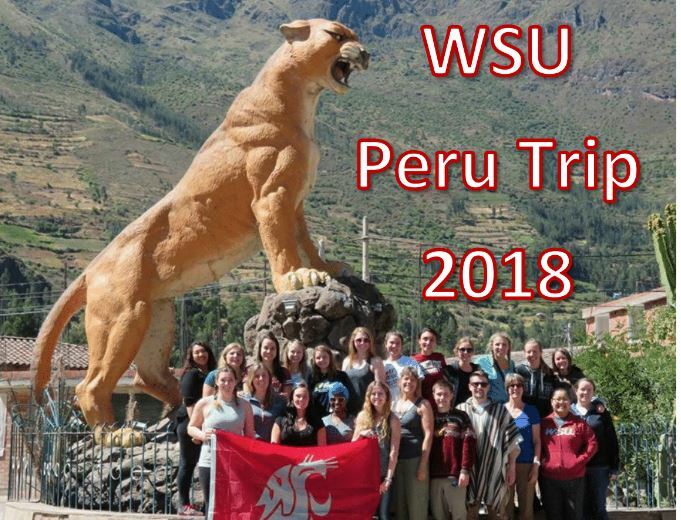 WSU nursing and pharmacy students staff a health clinic in Peru. An 82-year-old female who did not have a home had not been able to see correctly while reading for the past seven years, along with mild pain that had been radiating down her leg. When assessing her vision, she began to cry as she could see clearer and clearer with each pair of glasses we tried. When finding glasses that fit her eyes, she reached out and gave me a hug, saying how thankful she was for our team and what we were doing. In this moment, I realized how the little things in life can make such a large difference. A simple pair of reading glasses can mean so much to someone who truly needs them. A 36-year-old mother brought her son into the clinic who was 10 years old and diagnosed with Down syndrome. She said he had on-and-off constipation, but was currently not having any symptoms. We educated her on the fact that a child with Down syndrome may have inconsistent bowels, and this can be normal – and it is important to keep a high fiber diet for the child. The mother said she had been to several doctors who told her constipation is normal with this diagnosis, but she wanted an American opinion on this idea as well. It was very interesting to see that she trusted us as nurses and doctors to properly help her with this concern. She walked up to me after the clinic and thanked me again. Overall, I had a very humbling experience today – knowing I was able to help many members in this community in little ways that made a large impact on their everyday life. I absolutely loved getting to know the Peruvian culture, healthcare, and each member of this community throughout the day. On to to the next adventure! Dragon’s blood is a red sap from trees found in the Amazon rainforest. 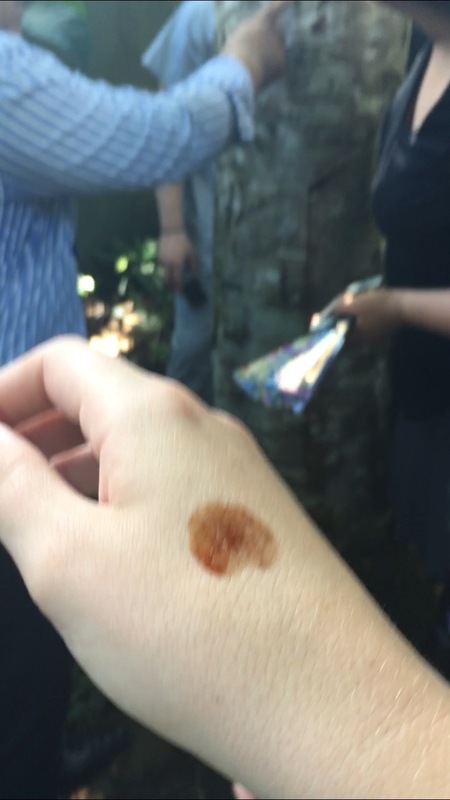 After rubbing, Dragon’s blood turns white. Today’s adventures were nothing but unbelievable — as I assume every day will be here in Iquitos, Peru. We started out with another wonderful breakfast and soon got on our way to visit and tour the Institute of National Medicine. Here, the employees grow medicinal plants of all shapes, colors, and sizes in order to help their community with all kinds of injuries and illnesses. We met the director of the Institute and he graciously toured and educated us on many different medicinal plants and what they are used for. My personal favorite was the tree that produced “Dragon’s blood” once it was cut into. 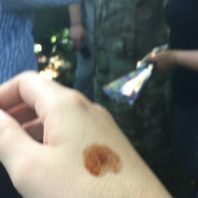 We all received a drop of the red Dragon’s blood and were told to rub it in until it produced a white sticky cream or lotion (as seen in photos). Incredibly, the Peruvians use Dragon’s blood to heal wounds and stomach ulcers. 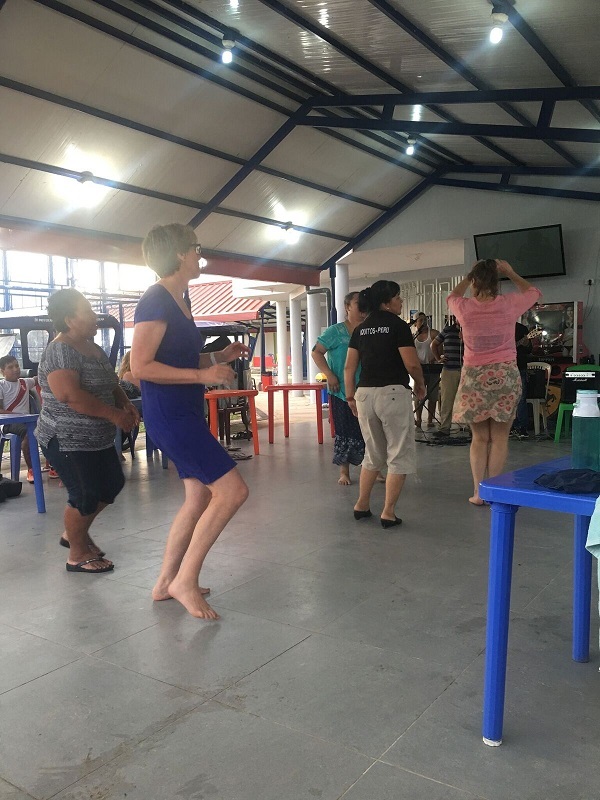 Later in the afternoon, we were able to visit the Regional Hospital of Iquitos where we spent our time dancing and interacting with 11 mental health patients and their nurses. As we talked and got to know them, we were able to ask questions regarding nursing care and what we can do to help improve the experience of someone with mental illness. One response that I enjoyed was when a nurse told us that in order to care for someone like these 11 patients, you have to be incredibly strong mentally, more than most people are. It really stuck with me after we had left and gotten to know these 11 people and their nurses because it was evident how much care and time the nurses specifically put into these patients. After the hospital we toured the Posta, or clinic, of that part of Iquitos. There we saw rooms dedicated to emergency care, cancer, obstetrics, dental care, and pediatrics – all in one building. At the end of the tour, we were told that this clinic sees about 200 people a day! Lastly , some of us decided to go to a Zumba class with Sarah and Sandy (WSU faculty advisers) as well as some of the translators. During this class, we danced and sweated profusely for a whole hour, but it was one of the best experiences for all of us. It’s safe to say we all went to bed early and sore tonight! WSU nursing and pharmacy students prep for a clinic. To summarize the activities of today is almost impossible. We had the opportunity to visit a private nursing school and to set up a clinic in a women’s prison. Although visiting the school was an enlightening experience, the clinic made a huge impression on me. The women in this facility were not what I expected. They had big smiles on their faces, they laughed easily and they were so grateful for our help. When we walked into the building, all of us were so hot that we had sweat dripping down our bodies. At first it was chaotic as we tried to set up the stations, but as soon as the first patient walked up, it was like a light switch turned on. We were greeting people, triaging them, assessing them and giving education. It was impressive to watch all of us work together and with ease. I worked in one of the assessment teams and I was able to talk to a lot of women. Based upon their triage assessment, my group was able to ask more direct questions about their chief complaint. Afterwards, we would give our information to Sarah or Sandy (WSU College of Nursing faculty) and get the proper interventions. Meanwhile, we had several other people helping out at the dental station where the patients were able to receive not only toothbrushes, floss and toothpaste, but also were able to have their teeth cleaned. Furthermore, some of the students were handing out other supplies such as eyeglasses, which seemed to be a major hit among the Peruvian women. It was funny to see them all reach for the colored eyeglasses even when they had no issues with their vision. They just loved the beautiful colors. All in all, this clinic was a major success and I know that I speak for the entire group when I say that this experience was unique and unforgettable. WSU nursing and pharmacy students in Peru. Palm grubs, which tasted like grilled sausage. We just had an amazing second day here in Peru with the People of Peru Project. We started off our day with visiting and touring the Belen market. We took motorcars down to the market, which was a great and very fun experience. At the market we saw an assortment of different fruits and vegetables and meats for sale. What was interesting and cool to me was that they do not waste anything or any part of the animal; they sell the head, legs, heart, intestines, etc. We also saw people selling traditional medicine, which was very interesting. It surprised me because they have a natural remedy for almost anything. 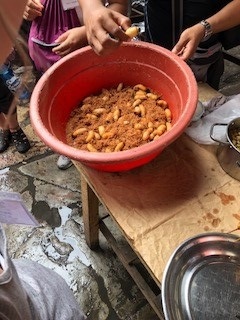 We also got the opportunity to try eating palm grubs, which live in the palm trees. Surprisingly they tasted very good and somewhat like a grilled sausage! After we got back from the market, we spent the second half of the day doing a community assessment. We talked to the people who lived there and learned a lot about their day-to-day life. The people in the community were very welcoming and very excited to talk with us and answer our questions, even on Mother’s Day! Some families gave us gifts for visiting them such as coconuts from their yard or homemade goodies. Everyone we’ve come across has been so friendly and thankful, which makes it very fun to meet them and learn from them. I am extremely excited to continue learning from them and their culture, and experiencing new and different things each day. 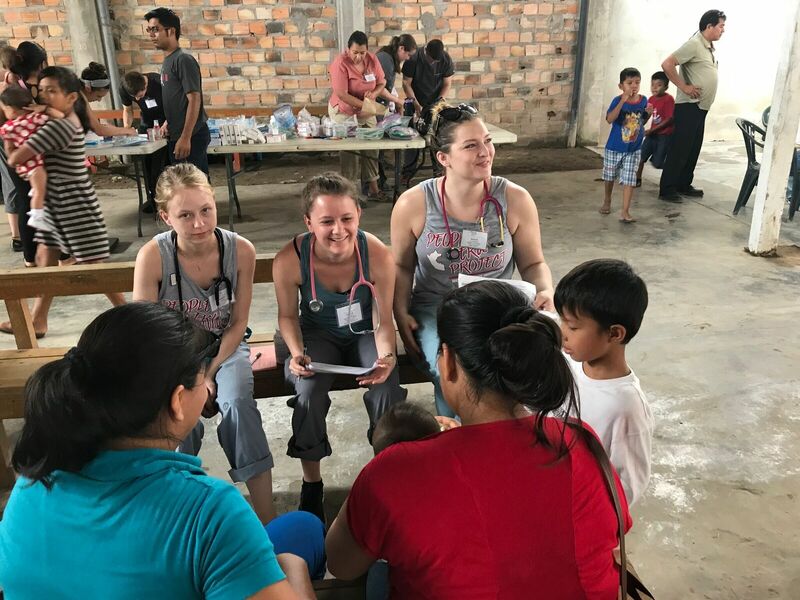 What motivates WSU nursing and pharmacy students to take four flights over 36 hours without sleep to Peru to spend weeks in the hot and humid Amazon basin? Answer: The opportunity to study abroad and step outside comfort zones in order to learn the core values of caring, integrity, altruism, maximizing health potential and social justice. This year, 19 students accompanied by four faculty are partnering with the People of Peru Project (POPP) in Iquitos for the 13th year in order to fulfill the POPP mission of “Relief of human suffering, caring for children, education for self-help and planting the seeds of hope.” Over the next 19 days you will hear from the students about their experiences doing community assessments, individual health assessments, group teaching projects, and applying the concepts of health literacy, social justice, global citizenship and cultural awareness. Today, we arrived by plane, bus, and motor car in Iquitos, Peru where POPP met us to begin our discovery with a trip to the first POPP project called POPPY’S house: an orphanage for young girls. Students were equally impressed by the lack of American creature comforts and the slower pace of life and emphasis on relationships. The beauty of Peru is balanced by the lush green landscape with interesting flora and fauna, and the tenacity and perseverance of people who build cement walls by hand and adapt to the rapidly changing weather with a smile. Over the next few weeks, students will provide community-based medical clinics in a women’s prison, a jungle village, and wherever the bus drops us off. They will visit a school for children with special needs, the Institute of Indigenous Medicine, a mental hospital, an outpatient clinic or Posta, the area’s colleges of nursing and pharmacy, and the Belen market to name a few places. There will be plenty of time for reflection, connection, and learning about the health and environmental needs of the Peruvian people. We only hope that we can leave behind as much as we will take away through this service learning opportunity. Stay tuned for more.